Constance Wu has a lot to smile about these days as the leading lady in the upcoming Crazy Rich Asians movie, playing opposite dreamboat Henry Golding. Get a dazzling white smile like Constance’s sans the sensitivity, at a fraction of the cost, and on your own time with the “Ferrari of teeth whitening,” the IGNITE LED Teeth Whitening System. 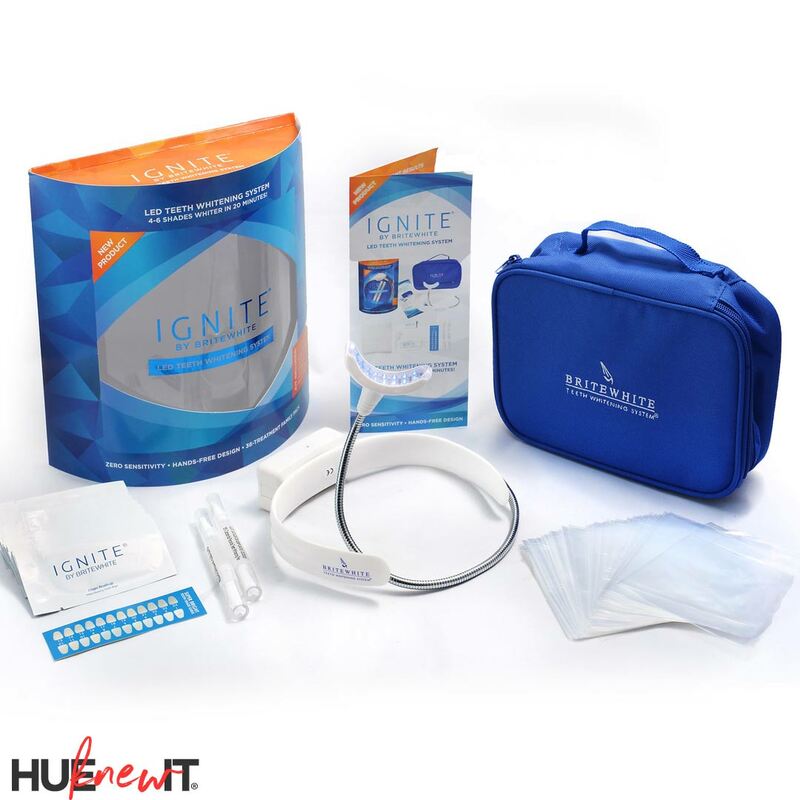 The IGNITE LED Teeth Whitening System by BriteWite is a hands-free device that brightens your teeth 4-6 shades in only one 20 minute session, and is a system that can be used up to four times in one day. Once exclusively sold to salons and spas across the country, this device is now available to anyone who wants a dazzling white smile. Designed with a proprietary whitening formula, IGNITE hydrates teeth to prevent sensitivity, and believe it or not, this device can also be shared! Don’t worry, you won’t get germs because the kit comes with 100 disposable mouthpiece covers along with a carrying case, whitening gel syringes, a 9 volt battery, teeth whitening chart, instructions, and one-year warranty. This device can be used by anyone 18 years or older, but cannot be used by lactating or pregnant women, or by anyone with periodontal problems or exposed roots. I’ve tested many teeth whitening devices in the past, and the one thing I wish is that they all came with a drool catcher…I’m not even sure how something like that would even be engineered! After I removed the mouthpiece it was filled with saliva, which by the way is safe to swallow even with the whitening gel combined! For IGNITE, there was some confusion as to what to do with the base where you insert the 9 volt battery…I set it on the table as I worked, but later realized that it should’ve been hooked around my neck during my treatment to make it a truly hands free device. All in all I did see some improvement after one session, but will probably ramp my use to see even brighter, whiter teeth.